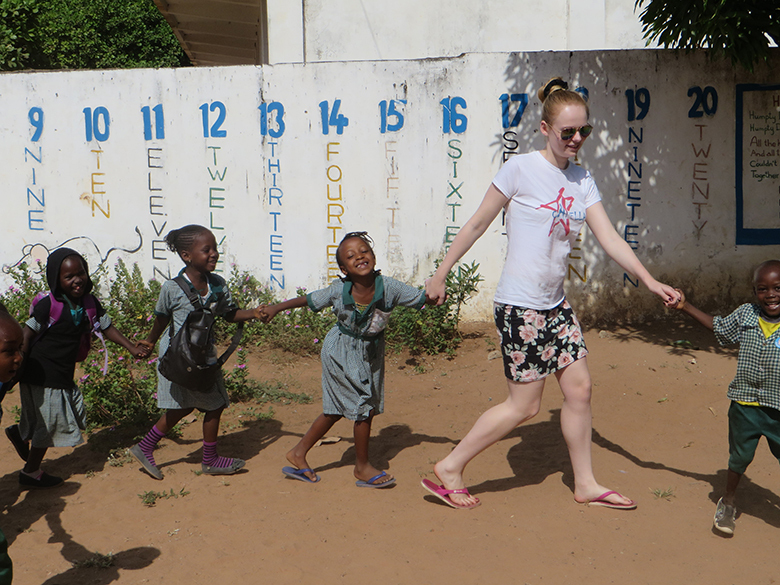 Generous students from The Sixth Form College, Solihull have just returned from a life-enhancing volunteer trip to a nursery school in The Gambia, for which they have raised over £16,000 this year. A group of 30 students joined the College’s Team Gambia project back in February and since then have been fundraising for the Jemus Jungkung Jammeh Memorial Nursery and Lower Basic School in Abuko, near Banjul. They each had a target to raise £400 each and their efforts culminated with a trip to The Gambia this month. The students spent a week in The Gambia, travelling to the school every morning and teaching the children, aged 4 to 6, in small groups. Many of the activities that the students undertook with the children were active and visual, such as singing, colouring, word and picture matching and there was also lots of outdoor fun and games. The Gambian children are used to rote learning in classes of 50 – 60 kids to one teacher, so this more personalised attention was very welcome. This project was set up by Peter Evans from Hamstead Hall School in Handsworth Wood. He has worked for many years to fundraise and build the nursery school in The Gambia from the ground up, so that children in this very deprived region can get an education. This is the fourth year that the Sixth Form College have participated in the project, bringing the total amount raised to more than £35,000. “Team Gambia 2016 have worked tirelessly all year to raise money and it was wonderful for the students to finally visit the school and see what all that hard work was for. I have seen how the students have benefited from this wonderful experience, learning valuable skills that will help them with whatever they go on to do after College. As well as working at the school, there was time for the students to experience more of the local environment and culture. They visited the mangrove swamps, a monkey sanctuary, Serrakunda fish and textiles market and the newly opened Parliament building in Banjul. They also sampled the local entertainment with traditional dancing and drumming and enjoyed some rest and relaxation on the beach. See more photos from this trip on our Facebook page.